Manufacturers and reps at the 2010 Western States Toy & Hobby Show showed off plenty of playthings for indoor activity, outdoor fascination and environmentally minded kids. Can You Imagine's Big Bang Rocket turns heads (and perks up ears!) with its loud pop created by placing a small piece of newspaper inside and tossing — clearly recycling in the name of fun. Kiz Toys continues to envelop kids in an impressive virtual space with new action figures/avatars and the company's USB keys that allow access to various games and adventures. Be Amazing! has packed some of its favorite experiments into an affordable bag with more than 60 activities, and Crorey Creations has updated and simplified the process of making friendship bracelets — a classic craft that hasn't gone out of style. Most of the top-10 toys below came from recommendations by specialty toy retailers who were at the WTHRA show, including Deb Deffinbaugh, COO of Timberdoodle Co. in Shelton, Wash., and John Naisbitt, owner of Thinker Things in Del Mar, Calif.
Apple Park's finger puppets were chosen by TDmonthly Magazine for their organic appeal and well-branded packaging (and the company's doubling of its SKUs since launching last fall, according to Toyology Sales Rep Kathleen Holley), I.D. Gear's stainless steel water bottles can answer parents' quests for fun and safe drinking products, and Holztiger's small, handmade push cars speak to the company's commitment of using water-based paints and high-quality parts, such as rubber tires for a smooth ride. See all 10 products below, and don't forget you can view more than 150 videos from the expo to help you in your fourth-quarter buying decisions. Reptangles: Turtles That Snap by FAT BRAIN TOY CO.
Each box set contains 24 Reptangles in green, yellow, orange, red, purple and blue that can be snapped and slid together in more than 100 ways. The turtles connect at various angles and come with an activity book with 40+ puzzles to encourage kids to think about geometric concepts and design as they build. Awards: Parent's Choice Award 2010. Launch date: 2010. The Big Bang Rocket is a "green" toy that recycles old newspapers to operate. Lindy Borkin, marketing manager at Can You Imagine, told TDmonthly. "Remember 'caps'? They used to be the only way to create a big bang. Well this is better, safer AND it recycles old newspaper," she said. Launch date: March 2010. — “Everyone likes it. They buy one for their kid, then they come back and buy one for a birthday present," John Blair, owner of Science Safari in Cary, N.C., told TDmonthly in April 2010. His store was already selling its second dozen of the rocket since ordering at Toy Fair in February. 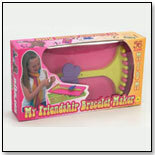 Designed to make it easier and convenient to create colorful friendship bracelets, the Friendship Bracelet Maker features an adjustable butterfly clip to hold the top of the bracelet during construction, as well as a holder to keep all the strings in place. It's travel-ready, with a pull-out drawer for string storage and instructions, and comes with 56 threads in 14 colors. Launch date: Fall 2009. 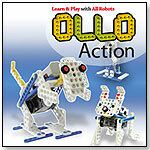 This robot construction kit includes pieces for children to make animals and figures that move via a one-geared motor. Eco-friendly Stainless Steel Drinking Bottles by I.D. GEAR INC.
Other products from I.D. GEAR INC.
Free of BPA and phthalates, these stainless steel drinking bottles features colorful, attached caps, clips for attaching to a bag, and a wrap-grip personalized for the child. Designs in more than 100 names are available. Other products from BE AMAZING! Jessie comes packaged with a USB key that provides access to Hub City and to Nuna, a magical, natural forest off the mainland in KizPlanet. Jessie is the steward of the "green" island of Nuna. She loves nature and animals, doesn't mind getting dirty, and is a mix of a tomboy spirit and a compassionate nature. With Nuna KizPals Jessie or Takoda, kids gain additional interaction points in Nuna and Hub City, unique areas for their avatar to check out, and new quests, games and adventures. Launch date: 2010. Made of organic materials, the Picnic Pal Finger Puppets are individually boxed and include Ducky, Lamby, Bunny, Cubby and Monkey. Launch date: May 2010. 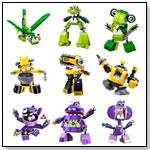 · UPDATED: See All 21 of ASTRA's Best Toys For Kids Winners!